It seems some people DO have success when it comes to having their complaints upheld by the BBC. As long as they belong to the anti-Israel brigade. 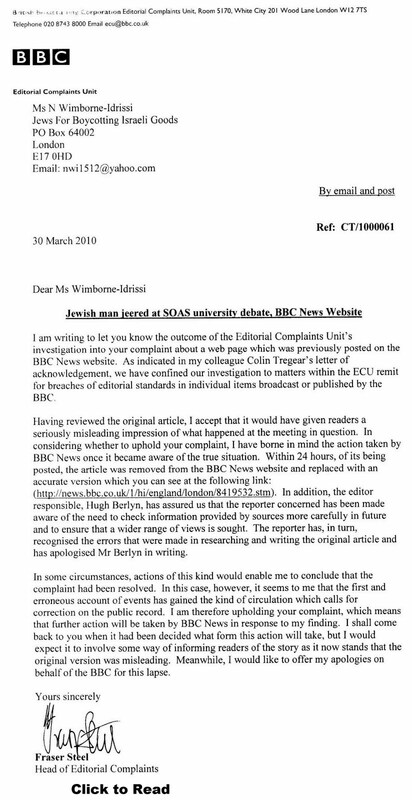 Should a report that shows anti Israel campaigners in a poor light accidentally slip through the net, the BBC Editorial department will leap into action. Nobody can interrupt a meeting or performance and come out smelling of roses. Certainly Tony Greenstein and Deborah Fink’s display of exhibitionism that ruined the Jerusalem Quartet’s performance at the Wigmore Hall was counterproductive in the extreme. I hope their ‘cause’ suffered a setback of disproportionately greater magnitude than the distress their disruptive outbursts caused to the musicians and the audience that had hoped to enjoy the performance. On the other hand, a meeting that took place at the School of Oriental and African Studies last year in which the guest speaker was Bongani Masuku, “a man condemned as an inciter of hatred against Jews by the South African Human Rights Commission,” was ‘disrupted’ by a question from Jonathan Hoffman about the morality of hosting such an event and inviting such a speaker, a hullaballoo ensued, which, unlike the one at the Wigmore Hall, was reported on the BBC website. Some furious lobbying by organisations such as “JustPeaceUK” were instigated, in order to get the BBC report amended to what they considered was a TRUE representation of what had taken place, and to omit the bit about the racist taunts. “After publication it quickly became clear that there was more to what had happened in the meeting than was apparent from the video and Mr Hoffman’s allegations. As soon as that became clear the story was amended to reflect the differing views of those who had been at the meeting. Not only that, but the Head of editorial complaints, Fraser Steel has written apologising profusely and promising to take further action. We must wait with bated breath to see what that will be..